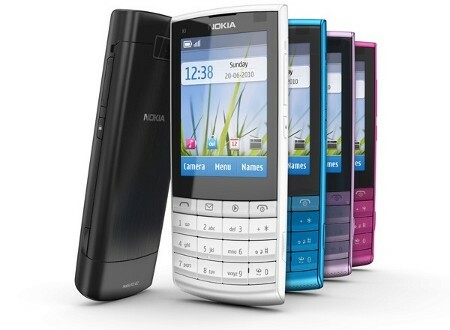 Nokia, the Finnish cellphone manufacturer, is back with a new cellphone which will cater to the entry-level range. We’re talking about the super slim Nokia X3 Touch and Type, where it will come with a touchscreen display as well as a traditional 12 button phone keypad. While touchscreen displays tend to make an appearance in the higher end range of handsets, this one is an entry-level model. Touted to be Nokia’s first ‘Touch and Type’ phone, the Nokia X3 enables users to tap quickly on the bright color touchscreen display without losing out on the familiarity of the full keypad for quick fire text messages and phone calls. Expect the Nokia X3 to hit the market sometime in the third quarter of the year, where it will retail for around 125 Euros sans taxes and subsidies. Just how slim is it? Well, it measures less than 1cm thin – 9.6mm, to be exact, placing it in the echelon of the slimmest Nokia handsets to date. It can slip easily into the purse or the pocket, and won’t look out of place in the office despite being entry-level, thanks to a brushed aluminum back cover alongside a choice of five vibrant colors that were specially designed to suit any mood or wardrobe. You won’t find it short on connectivity options though, as it will feature both 3G and Wi-Fi support, not to mention a built-in music player and an integrated FM radio just in case you have exhausted your collection of MP3s on it. A 5-megapixel camera is also thrown into the mix, featuring 4x digital zoom with the ability to capture video and photos. To remain up to date, the Nokia X3 will also come with Ovi Mail, consumer email and chat accounts which can be pushed direct to the phone via Nokia Messaging. Depending on the market where the X3 is launched, it might come with Ovi Music Unlimited, letting one access a virtually limitless range of the latest hit music, where you will have a field day filling up a 16GB memory card. If you’ve been searching for a no-frills handset with a touchscreen display and yet don’t want to break the bank, the Nokia X3 might be just the ticket.